Need a little something sweet to brighten up your day? What better way to put a smile on any face than a batch of colourful sunflower cupcakes! This original recipe comes from a one of a kind book entitled Hello, Cupcake written by Karen Tack and Alan Richardson and are guaranteed not to disappoint. First of all, they are cupcakes — cake you can eat on the go — brilliant! Secondly, they are absolutely adorable and surprisingly simple to craft. Bake the cupcakes by following the instructions on the package. Try to use green cupcake skirts – more commonly known as cupcake liners – to continue the garden-like look. Spoon a chunk out of the top of each cupcake and place an oreo in the space. Next add yellow food dye to the remaining can of icing. Using a fresh icing tube, paint on two layers of yellow petals, using the same method you did for the leaves, only making the petals wider and more triangular. Break out the third icing tube and introduce the chocolate! Put a tiny dollop of chocolate icing on the spot you want your ladybug to sit. Place a red M&M on top of the dollop, making sure the telling white ‘M’ logo is facing down. Carefully paint on spots and lines to make your ladybug come to life. Allow cupcakes to sit overnight, so that the icing well and truly sets, and enjoy the next day! This Valentine’s Day, we decided to feature some of the most beautiful cupcakes out there. The following are just a few suggestions (in random order) we have received from our readers. If you own a bakery shop or sell cupcakes online and have gorgeous Valentine’s Day cupcakes, don’t hesitate to contact us! If we like your “artwork”, we might feature you, too! Check out Part 2! Melody Brandon, Owner and head Pastry Chef, realized her passion for desserts and stopped her pursuit of a career as a teacher and jumped head first into the world of butter, sugar, and flour! She headed to pastry school and graduated from the Le Cordon Bleu program at the California School of Culinary Arts as a Pastry Chef. She started Sweet & Saucy Shop with the desire to create gorgeous, delicious, modern looking desserts. Location: Long Beach, California or Sweetandsaucyshop.com. Cupcake’s cupcakes will whisk you away to your childhood with just the first look! One of their Valentine’s Day cupcakes: Black Bottom Cupcake – a dark chocolate cake with chocolate chip cheesecake baked in complimented with cream cheese icing . Mix & match a dozen -$30.00 or $2.75 each. All of their cupcakes are made to order with real butter, whole milk and buy organic ingredients whenever possible with no preservatives. Nine flavors are baked every day for our customers. Their cupcakes are made-to-order, so they are at their very best! Special orders are always welcome with 24 hour notice. Kupcake Kitchen is a special-order cupcake company located in Santa Clarita, CA. All of their cupcakes are baked from scratch using only the freshest ingredients, are made to order, and are never frozen. Prices: $15 for 12 mini kupcakes or 6 standard kupcakes. Decadence D’Or (from Sweet Surrender) is a sumptuous cupcake, handcrafted from the most exclusive, rich, and enterprising ingredients around the globe. One main ingredient in Decadence D’Or is Palmira Single Estate Chocolate. This special chocolate varietal is derived from the rare and fragile Porcelana Criollo bean and cultivated to its fullest state of richness exclusively at the Valrhona plantation in Venezuela. Complementary to the Palmira Single Estate Chocolate is Tahitian Gold Vanilla Caviar. This fruit, after it is ripened for nine months, then hand-harvested, cured, sweat, dried, and hand-split, is obtained only by tedious manual extraction; it is truly a delicacy, both in taste and exclusivity. Topping the Decadence D’Or is the masterfully smooth Louis XIII de Remy Martin Cognac, 100 years in the making, and edible, metallic gold flakes, each painstakingly hand-placed. Finally, once baked to perfection, this grand dessert is encased in a stately, hand blown sugar Fleur-de-Lis and presented on a handmade exclusive elegant crackled-gold glass curved plate and bowl. Talk about the royal treatment! Chef Long Nguyen, executive pastry chef of The Venetian and The Palazzo is the visionary genius behind all the exotic cupcake flavors and Chef Johann Springfield, head baker makes the cupcakes a reality. Location: Sweet Surrender, located on The Palazzo casino (Las Vegas) floor next to guest elevators; special orders can be placed by dialing 702-607-0753. Since last Fall, Diana Sproveri Cupcakes have been delightfully devoured by Hollywood celebrities, busy executives, and hard-working mommies. Diana Sproveri’s designer baked goods have appeared in Sunset, People, and Good Day LA. Why all the munching and buzzing? Diana Sproveri cupcakes are artisanal, decadent, and crafted from heirloom recipes. No matter the occasion, they make a great and delicious dessert! Pricing: Online pricing is $36 per dozen. With premium Valentine’s gift-wrapped packaging, $47/dozen. Sprinkle Heart: Vanilla bean cupcake frosted with vanilla bean buttercream, rolled in solid red sprinkles that shape a heart. Cherries Jubilee (aka Bleeding Heart): Vanilla bean cupcake filled with cherry pie filling that overflows out of the vanilla bean buttercream. Take a bite and cherries flow out! Location: Yummy Cupcakes has two locations in LA but they ship nationally so anyone can enjoy their 175+ designer cupcake flavors, 42 vegan flavors, and 100% natural ingredients. 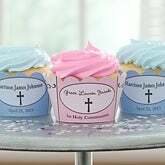 Website: YummyCupcakes.com. Sweet E’s, “the mini bake shop” is LA’s premier Dessert Delivery service. Sweet E’s bakes the perfect size treat, 2-3 bites of pure delight. They offer an array of deliciously convenient mini cupcakes, cake pops, brownies, and more! Everything at Sweet E’s is baked from scratch using only the finest ingredients, then hand decorated and delivered straight from their ovens to your table. Sweet E’s specializes in customizing cupcakes, cakes, & cupcake towers to match the style and theme of any event. They will help you visualize your dream and design your creation specifically for you. Valentine’s Day Special: Chocolate Covered Strawberry Cupcake Strawberry cake with milk chocolate frosting. Price: Valentine’s Day cupcakes – $66/2 doz. Every Valentines Day, Kumquat Cupcakery- a catering company in New York City, drops the minimum of 3 dozen to 2 dozen cupcakes and adds a cute little holiday card. This year they are doing something really special: they are offering a box of “roses”! An assortment of vanilla, chocolate, and red velvet cupcakes adorned with different shades of frosting in the shape of roses. Kumquat Cupackery was mentioned in many printed magazines and even on Martha Stewart! Price: Each box is $48 + tax. Beat the sugar,vanilla extract and egg yolks together. Add the oil and water, beating well. Beat the egg whites until stiff and fold into batter. Turn the batter into a greased 24cm by 34cm oven pan or scoop into cupcake liners. Bake for approx. 30 minutes (if you chose to make it into cupcakes bake only for 15-20 minutes). I used muffin size cupcake liners. Heat the ingredients together and pour over the hot cake . Leave it to cool. Bring the cream to boil, remove from stove and add your chocolate. Mix until all chocolate is melted. Pop into the fridge and stir every 10 minutes until it reaches the desired consistency for piping. You can add some coffee in your cream when boiling for coffee ganache. Looking at the ingredients, one is inclined to think that this cake is very sweet, but that is not the case at all. It can also be served as a dessert.